Fanconi Bickel syndrome is a rare glycogen storage disease characterized by glycogen accumulation in the liver and kidneys caused by impaired carbohydrate metabolism, resulting in impaired galactose metabolism and severe renal tube dysfunction. Fanconi Bickel syndrome is an autosomal recessive disorder requiring one copy from each parent or 2 mutated copies total (homozygous) to express the traits of the disease. Individuals with compound heterozygous mutations, or one copy of more than one mutation on the responsible gene, can also express the traits of Fanconi Bickel syndrome. Carriers, individuals with only one copy (heterozygous) for the mutation, do not have Fanconi-Bickel syndrome. The onset of Fanconi Bickel syndrome often appears in the first year of life. FBS is marked by the inability to thrive. By the age of 2, an affected individual often has an enlarged liver and kidneys and possibly rickets, a condition that makes bones pliable, weak, and prone to bending. FBS can also cause dwarfism. Fanconi Bickel syndrome is an inherited genetic disorder. 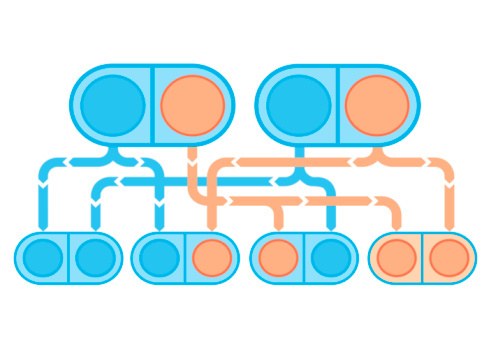 Mutations in the GLUT2 gene have been linked to FBS. Additionally, FBS has been linked to children with parents who are blood related (consanguineous). Complications associated with the symptoms of Fanconi-Bickel syndrome include bone fractures, pancreatitis (pancreas swelling), and osteoporosis (weakening of the bones). Fanconi Bickel syndrome can be detected during neonatal testing. Because patients with FBS are intolerant to galactose, a type of sugar found in lactose-containing dairy products, among other sources, a neonatal test checking for galactose intolerance can help diagnosis FBS. An X-ray is used to examine bones for patterns of rickets. Urine tests can measure glycose, phosphates, amino acids, and bicarbonate levels in the body. A liver biopsy can detect abnormal galactose oxidation. There is no fully effective treatment for Fanconi Bickel syndrome. Supplement treatments consisting of water, electrolytes, and vitamin D may be used in combination with a galactose-restricted diet. A diet that is low in sugar and carbohydrates and small, frequent meals is recommended. Following these guidelines can improve growth rates and enhance the quality of life for the patient. There is little information about Fanconi Bickel syndrome because it is so rare. The exact incidence of FBS has not been determined, but it is believed to occur in less than 1 in one million births.